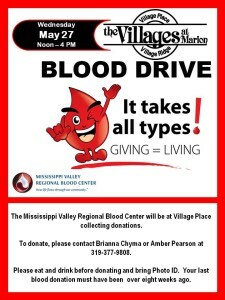 The Villages at Marion will be hosting a blood drive from noon to 4p.m. Wednesday, May 27th at the Independent Living building, Village Place. Blood donation is a safe and simple procedure that takes about 45 minutes to one hour. Donors must be in good health, weigh at least 110 pounds and be at least 17 years of age. We are looking forward to hosting this great event and saving lives. Each unit of blood donated will help 3 other people in need. Every 2 seconds, someone in the United State requires a blood transfusion. There is no substitute for human blood so the gift of blood, is the gift of life. If you are interested in making a donation, please call Amber Pearson at 319-377-9808.